In the first three quarters of the year, China¿s GDP reached a growth rate of 8.2%. For the whole year 2000 a growth rate of the economy of 8.1% seems likely now. This favourable development was supported by a persistent export boom, higher than expected investment and a moderate recovery of consumer demand. 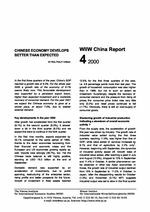 For the year 2001 we expect the Chinese economy to grow at a slower pace, at about 7.5%, due to weaker external demand.